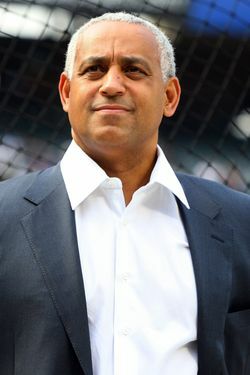 Omar Minaya, according to the Daily News, "spent the 2011 season with his family, informally advising other general managers and appearing on television and Internet shows." Which seems like a pretty good gig, considering that even after Sandy Alderson replaced him as general manager, he was still being paid by the Mets. In fact, he's still owed roughly $1 million in 2012, the final year of a contract extension he signed following the 2008 season. But Minaya's been getting offers for jobs with other major-league teams, and that's good news for the Mets' bottom line: If he takes one, they'll be able to deduct his new salary from what they owe him. The News reports that Minaya's friends say he's sifting through six offers (for positions like special assistant to the GM or scout) and is close to making a decision. One of those job offers is from the Blue Jays, and as the Times points out, that'd be an especially interesting destination, considering Minaya once hired Toronto GM Alex Anthopoulos as an intern in Montreal. A couple of Minaya's biggest mistakes as GM come off the books this off-season, and now, it looks like the team will be able to save some of the money they'd otherwise owe to Minaya himself. The Omar Minaya era in New York may have effectively ended when Sandy Alderson took over and started cleaning up the mess he left. (Though it had been discussed, the Mets never did find a role for Minaya after he was relieved of his GM duties.) But if the Mets can save a few bucks while Alderson continues that rebuilding process, surely they won't complain.